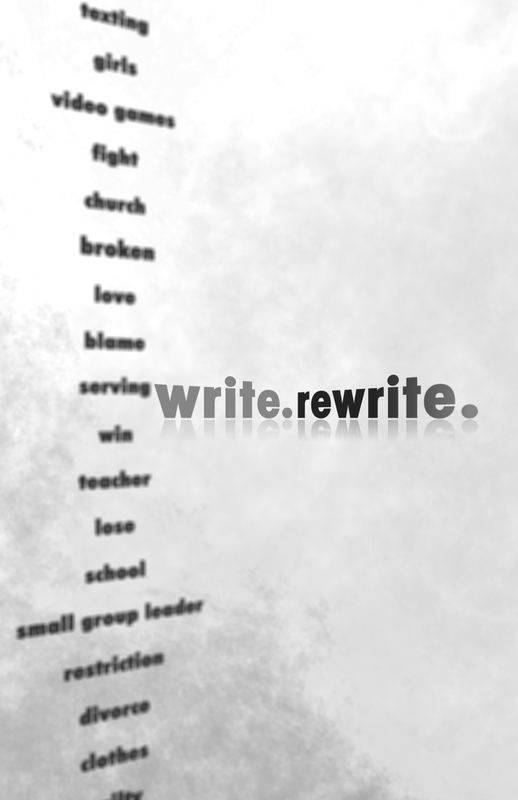 WRITE.REWRITE… it’s coming! | BRING. CHANGE. SHARE. Hey students (and parents)! For those of you that are joining us this weekend, we can’t tell you how excited we are. It’s going to be an awesome time and our hope is that you get to take your relationships with your Life Group to another level. Before you come, there are a few things you need to know. Okay, maybe more than a few… there are SIX things you need to bring. Here’s a list of what you need with you, arrival time is 6pm! Blankets/bedding/sleeping bag and an air-mattress. Our heads will rest on the floor… so make sure you bring something that will make that a more comfortable experience. Changes of clothes and toiletries. C’mon now, don’t think can wear the same clothes two days in a row. We all know that’s probably not the case for most of us. BIBLE AND NOTEBOOK. We cannot stress enough… YOU NEED YOUR BIBLE, always, and specifically this weekend. Do not walk out your door without it! 10-15 photos of your life up until now. We know, they’re all on Facebook, so if you have a minute–print some off to bring with you. Baby photos, first soccer game, baptism photo, the time you got the chicken pox, whatever you wish. Just bring 10-15 (appropriate) photos that tell a story of your life. Bring an item from your room that you think describes you. Bring a basketball, guitar, glasses, your favorite book… get creative! Just at least bring one item. Last, but certainly not least, bring your favorite T-SHIRT. No need to ask why, just bring your favorite t-shirt with you. Got all that? Did we mention that we’re excited?We hope you are, too. Come ready to have fun, take part, and discover the story you may not have known God is writing in your life. See you Friday night @ 6pm!